Jerry Montaguehas been a veterinarian for nearly 50 years. Monitoring the judicious use of medicated livestock feeds may be the main purpose behind the Veterinary Feed Directive, but encouraging and strengthening the veterinarian-client relationship appears to be a positive outcome. The directive, enacted on Jan. 1, left some producers with concerns and has some veterinarians on a tighter schedule attempting to balance additional tasks. Taylor Lingus, DVM, is a recent graduate of Colorado State University and works for High Plains Cattle Supply serving clients. She admits VFD limits the accessibility of medicated feeds to customers but is encouraged by the relationships she is building with her primarily large animal clients. High Plains Cattle Supply is a feed dealer and by having Lingus on staff, the hope is that customers will enjoy the benefit of quality veterinary care and the convenience of the ability to purchase feed on site. One of the groups heavily impacted by the directive are 4-H members, especially those raising market hogs. A script for medicated feeds would be written to an adult, Lingus explains. "It is good for kids to have an involvement on a 4-H project so they understand the ramifications of a VFD," Lingus said. "The beauty of 4-H is how closely parents and kids work together." 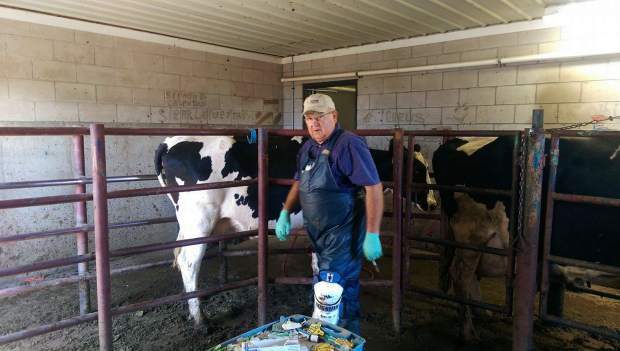 Since the VFD has gone into effect, Lingus said she has seen a number of customers hoping to purchase medicated feeds so the number of calls and the need for the veterinarian-client relationship has grown. There were a small number of people who hoped to circumnavigate the directive by purchasing raw ingredients to add to feeds themselves. "I tell clients to be cautious adding drugs themselves without the guidance of their veterinarian," she said. "It's important to be compliant with the new regulations." Lingus is enjoying the opportunity to strengthen her relationship with current clients but says an advantage is adding new clients and working with them to be proactive. "There will be a larger focus on paperwork and writing those VFDs," she said. "Veterinarians try to use antibiotics judiciously in general and I don't anticipate that changing." Jerry Montague, DVM, is one of the elder statesmen of the practicing veterinarians in the state. This spring will mark 50 years in practice for Montague and the VFD is one of the many changes to livestock care and production he has witnessed. Montague, who practices in the area surrounding his Merino, Colo., home maintains the same hopes as Lingus for a stronger relationship between livestock producers and their veterinarian. Many of the producers he serves, he said, have always made every effort to produce a safe, affordable and nutritious product according to best practices. This is due, in part, he explained, to the wealth of information available not only through their veterinarian but also through extension, cattlemen's groups, print publications, various meetings and resources online. Montague said in addition to the amount of information now available, the multitude of vaccines, medications and antibiotics have changed since he graduated in 1967. "When I started there weren't many squeeze chutes or antibiotics," he said. "We had penicillin, sulfa and tetracycline and the veterinarian did administer much of that himself. With the medications, vaccines, supplements, and feed additives, it's a complicated system now." Despite the growing number of options for producers, Montague says the quality care remains the same through the years and through the different programs presented. The VFD, Montague admits, is a mammoth undertaking to track and it, like many programs meant to provide a benefit to those involved, comes with challenges. One of the most difficult things to measure is the outcome. "With the dollars, the effort and the time put into this, you sure hope we're doing some good," he said. "In other words, we truly hope we're preventing antibiotic resistance but (a program's effectiveness) is a hard thing to prove."